I don't think I've done a proper skincare review in a long time, right? That's because they take a longer time to try out as I'd like to give my most honest opinion about the skincare that I'm currently trying. I've been using the Cellnique Pore Refining Express Kit for the whole of March and I gotta say, I'm pretty pleased with the results! In case you haven't read my previous Cellnique review, you can find it here too! The set has another name on the slide-out box - Amino-Collagen C Intense Set (Expert Series). It consists of 2 tiny bottles of serum. The serums' bottles are so precious in silver & pearlish-white colour! Each bottle comes with a dropper which I love because it's much easier to get the amount that you need and it's more hygienic. These two serums work synergistically to encourage a firm, youthful and elastic skin even within one week of application. The Amino Collagen C Intense Set I contains 20% L-Ascorbic Acid A, a natural vitamin C that lightens skin tone and dark spots while increasing collagen synthesis or production for skin firming & lifting. Because this is a high-potency Vitamin C serum, it also acts as an antioxidant, improve skin resilience and protects the skin against free radicals. Studies have also shown that skin colour will lighten up, become more even and dark spots & redness from blemishes will be lightened up. The colour of the serum is yellowish, as most Vitamin C serums so keep it properly to prevent oxidisation of product. The incorporation of Vitamin B5 also works to sooth the skin, decrease the depth of wrinkles and refine open pores within a week. Ok, the instructions that I got was to apply one drop for the whole face for the first 3 days. After that first 3 days, you can increase the dosage and apply 2 - 3 drops for the whole face. I thought this instruction was kinda weird as I usually just drop as much serum as I like on my hands first before applying liberally on the face (don't judge, you do that too :p). So on the first day, I actually applied about 3 drops cos I forgot about the instructions. LEMME TELL YOU, it stings! Especially on my pinples >< Also, my skin started peeling the next day so this tells you to always follow the instructions given to be on the safe side. Haha. After the first 3 days though, my skin calmed down and I've been using 2 - 3 drops of the serum ever since. I brought these two serums along with me when I travelled to KL last month and I guess the bottle wasn't closed tightly so the Intense I serum leaked. They weren't kidding when they said that it's high-potency, look what happened to the bottle cap! The silver layer actually started peeling off. That's why I'm much more cautious when using serums now cos imagine if this happened to your face >< Well, I can't judge the effect of this serum on it's own as I've been using it concurrently with Intense II so I'll show you the results if you read until the end! A mild stinging sensation and dull skin may appear initially. User may also experience gentle dead cell peeling during the application. Avoic applying on the peripherals of the eye and open wound. Amino Collagen C Intense Set II is an oil-free serum which contains a proven low-density Hyaluronate Acid (silk amino acid), a natural moisturiser which is able to attract 1000 times its weight in water. This makes it the perfect water binding agent to retain skin moisture and hydration. Kinetin also prevents skin discolouration by controlling the growth of melanin, reduces wrinkles that causes pre-mature aging and improves skin texture, including mottled pigmentation. The addition of hydrolysed soy & milk protein helps to repair damaged cells (natural scar healing), ensures fading of discolouration marks and instantly delivers a silky smooth texture after application. I have a feeling that this product will suit my mum a lot to help combat her pigmentation. It's also useful for people with dry skin like me. The instruction I got was to apply 2 - 3 drops onto the whole face after cleansing and after Intense I. This serum helped to calm my skin down significantly after the strong reaction from the first serum. The subtle scent it has is quite pleasant, possibly because of the soy content. It is slightly stickier than the first serum but also absorbs quickly into the skin. I like it a lot! And how's my skin texture after a month of incorporating these serums into my skincare routine? I believe the most significant results would be on my forehead. I get acne on my forehead whenever I'm stressed or during that time of the month. It can get quite bad with occasional bleeding and scarring if I try to pop the pimples, and has caused my skin colour to look uneven as well as leave tiny bumps on my forehead. After a month, you can see that the acne scars are more or less gone, redness has disappeared and my skin tone has become more even & less dull! 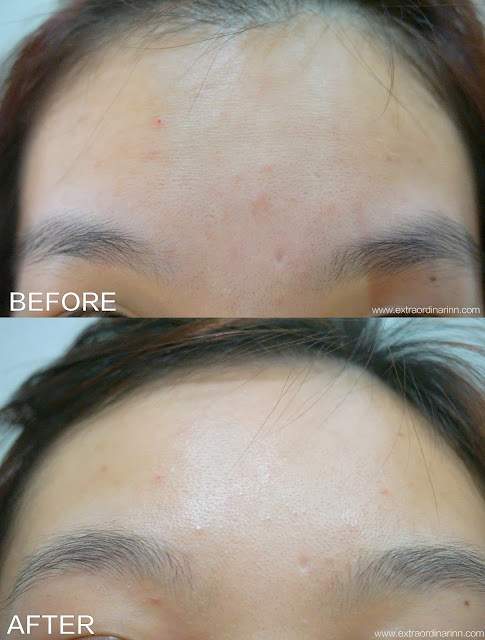 The tiny pores on my forehead has significantly reduced as well to be replaced with a much smoother surface. I dare to leave the house without makeup except concealer on my undereye since I've used this. I've stopped using the serums for 2 weeks now and I'm starting to see the acne come back so I'll definitely continue using them for the sake of good skin!